Taiwan-headquartered Far Eastern Apparel Vietnam Ltd. launched the construction of a 10-hectare garment factory in Bac Dong Phu industrial park in Dong Phu district, the southern province of Binh Phuoc on November 10. 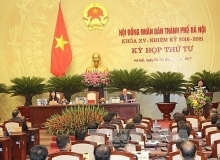 The factory, the second facility of the firm in Vietnam , is expected to become operational in February 2016 with 36 production lines, employing more than 4,000 labourers in its first phase. In the second phase from the end of 2016, the number of production lines and employees are both expected to be doubled. 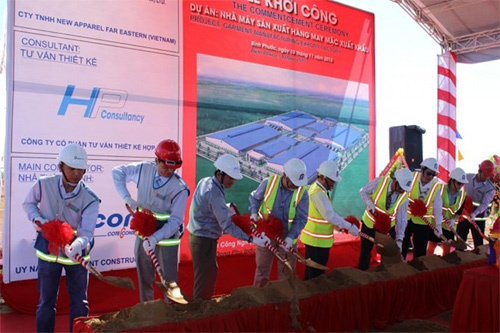 Speaking at the ground-breaking ceremony, Nguyen Huy Phong, Deputy Standing Chairman of the Binh Phuoc People’s Committee pledged to create favourable conditions for the firm in implementing the project as schedule. He suggested the provincial vocational training centre coordinate with the company in recruiting workers for the project. The first Far Eastern Apparel factory is located in the neighbouring province of Binh Duong./.